James Seymour, paid on-call firefighter/EMT in Orrington, helps put tested hose onto Engine 2 Sept. 13, 2018. 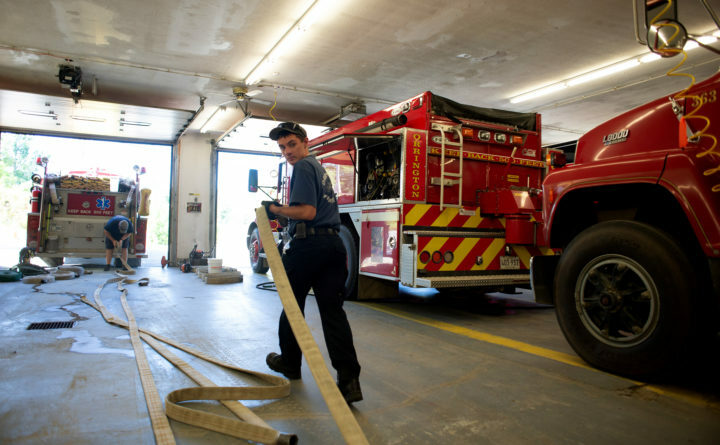 Orrington officials are looking to build a new $3.5 million public safety building at the corner of Center Drive and Tupper Drive that would combine fire and police. If it is going to be built, the building that will house Orrington’s police will be constructed with every legality observed. Even if it means rescheduling a meeting because somebody forgot to sign something. Residents were due to vote on Orrington’s proposed new $3.5 million public safety building at a special town meeting Oct. 23, but on Wednesday, Interim Town Manager Andrew Fish and Town Clerk Susan Carson became aware of something wrong. Town residents may not have been legally notified of the special meeting because the Board of Selectmen had not signed a warrant in accordance with state law, despite notifications being sent to every address in town. Due to this, any vote taken at the meeting would not be considered legal, Fish said in a letter to residents dated Thursday. So the meeting set for Oct. 23 is canceled. Selectmen will hold their regular meeting Oct. 22, set a new date for the meeting and properly sign the warrant authorizing another notification of a new meeting date to be sent out, Fish said. Fish asked residents to be patient.